Sony's latest 24.3 MP Exmor® APS HD CMOS sensor; advanced Fast Hybrid Autofocus system; SVGA Tru-Finder. 16-50 mm power zoom and 55-210 mm telephoto lenses included. Astonishingly fast, Sony's sophisticated BIONZ X™ image processing engine reproduces textures and details in real time as seen by the naked eye. The resulting images are remarkably realistic with especially rich tonal gradations and a natural three-dimensional appearance. Whether shooting still images or movies, visual noise is nearly imperceptible, thanks to further advanced area-specific noise reduction. Detail reproduction technology delivers more finely detailed textures while diffraction-reducing technology optimizes the performance of any lens you mount to enable advances such as finer details at small aperture settings. Capture every subject clearly with unparalleled precision, at record speed, thanks to Sony's newly advanced Fast Hybrid AF with vastly improved phase-detection and contrast-detection capabilities. Faster data reading from the image sensor, higher-speed BIONZ X™ data processing, more advanced AF algorithms and optimized control of the lens drive delivers approximately 35% faster performance than in previous systems. *Among interchangeable-lens digital cameras equipped with an APS-C image sensor as of February 12, 2014, based on Sony research. Measured using internal methods with an E PZ 16-50 mm F3.5-5.6 OSS IS lens mounted. CIPA guideline compliant. Button customization lets you shoot just the way you like for greater speed and convenience. You can assign any of 47 functions* to any of 7 buttons (including two dedicated custom buttons), and assign up to twelve functions to the Fn button for quick access. *Some functions can only be assigned to certain buttons. One-touch remote lets you use your smartphone or tablet as a viewfinder and remote control for a digital camera, and one-touch sharing lets you transfer your photos and videos from your camera. Either way, by installing the Imaging Edge Mobile1 app to your NFC-enabled Android smartphone or tablet, you can avoid complex set-up sequences and establish wireless connection simply by touching your device to the camera. You are now ready to control your camera from your smartphone to take a photo from a previously out-of-reach spot, or simply be in your own group shot, as well as transfer them instantly to your smartphone for sharing on SNS. No NFC No problem. You can also pair the devices manually. This product is compatible with Final Cut Pro X and iMovie.3. Elevate your photography with Imaging Edge desktop applications. Use "Remote" to remotely control shooting; "Viewer" to quickly preview, rate, and select photos from large image libraries; and "Edit" to develop RAW data into high-quality photos for delivery. Get the best from Sony RAW files, and manage your productions more efficiently.4. GregAlston99, Petersburg, VA: I am truly satisfied by the weight, quality, and the pictures that I have taken. This was my dream camera. I bought it on New Years Eve 2018 and since then, I have taken over 8000 photos. It was worth it. footnote1 A successor application of PlayMemories Mobile™. Existing PlayMemories Mobile users can use this by updating PlayMemories Mobile. footnote2 Please contact Phase One regarding all inquiries as to usage and support including functional compatibility of Capture One Express (for Sony) and Capture One Pro (for Sony). footnote3 Final Cut Pro, iMovie, and Mac® are trademarks of Apple Inc., registered in the U.S. and other countries. The Mac logo is a trademark of Apple Inc.
footnote5 Services vary by country. © 2014 Sony Electronics Inc. All rights reserved. Reproduction in whole or in part without written permission is prohibited. Sony, BIONX X, Exmor, Tru-Finder, PlayMemories Camera Apps and the Sony logo are trademarks of Sony CorporationHDMI is a trademark of HDMI Licensing LLC. Wi-Fi is a registered trademark of the Wi-Fi Alliance. All other trademarks are trademarks of their respective owners. Sony is not responsible for typographical and photographic errors. Features and specifications are subject to change without notice. 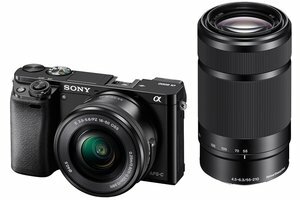 The Sony Alpha 6000 has seriously fast continuous shooting for the money, and its design improves upon its predecessor's already excellent one. Plus it's got an extensive feature set. The movie record button remains annoying, and while it delivers excellent photo quality, it's not best-in-class in low light. It's also slow on startup. 8.4 OVERALL The overall rating is 8.4 out of 10. Design 9.0 out of 10 Design rating is 9.0 out of 10. Features 9.0 out of 10 Features rating is 9.0 out of 10. Performance 8.0 out of 10 Performance rating is 8.0 out of 10. Image quality 8.0 out of 10 Image quality rating is 8.0 out of 10.